So wait... pathvain_aelien and I were looking for a character in the Mortal Instruments series...and we got a Mario character?! Best Google stupidity ever. 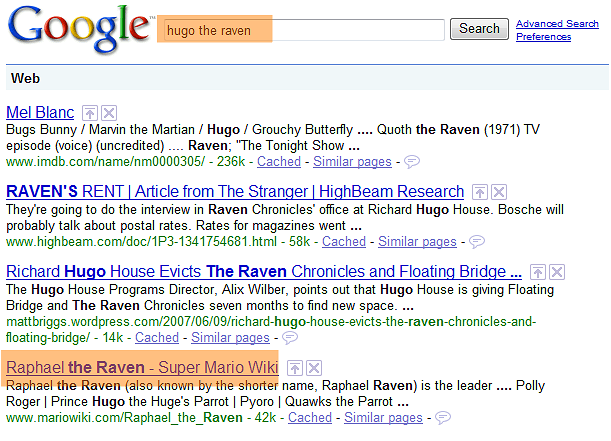 Crazy idea of a Mortal Instruments/Mario crossover aside, does anyone know the name of the other raven Hodge had? You know, it was Hugin and something else? That's what we were looking for, but we couldn't find it. Maybe when I finally decide to restart my crossover webcomic PrtSc Land starting from when the actual plot came in, I'll put in Mortal Instruments characters. It already has Mario. And a ton of other things. I would love to see Jace in it. Of course. And, since Stephen and I are reading City of Bones, I guess I will figure out eventually what the other raven was called. If you're talking about PrtSc Land once it's restarted, I was thinking about putting Clary, Simon, Jace, Alec, Isabelle, Magnus, Luke, Jocelyn, Valentine, Sebastian, and Hodge in it. So yep, Jace will be in it if I do that.